Somebody’s fertile imagination may have made the story spicier but there is no denying the fact that Sikhs monopolised India’s national game in the 60s and 70s. But long before Singhs were kings, the community of Anglo-Indians — miniscule in population and lightweights in political power — ruled the sport for almost three decades. Anglo-Indians played hockey in pre-independent India as if they had been preordained to do so. The stick, it would seem, was an extension of their bodies. India made their hockey debut at the Olympics in 1928 and duly demolished all their opponents to win gold. That marauding squad of 1928, spearheaded by the incomparable Dhyan Chand, had nine Anglo-Indians. India’s victorious squads in the subsequent Olympics in 1932 and 1936 had eight and six Anglo-Indians respectively. Even the participation of India at the Los Angeles and Berlin Games was made possible by the generous funding of an Anglo-Indian team — the Rangers Club of Calcutta. The success of Anglo-Indians in pre-independent India is dazzling by any yardstick because the country had not yet been divided then. And, hockey was an inclusive sport, unlike the elitist cricket, under the colonial regime. India’s first Olympic captain, Jaipal Singh Munda, was a tribal educated in Britain. Muslims in what would later become Pakistan also played hockey with gusto. So the competition to get into the national team was fierce. But nothing could stop the Anglo-Indian juggernaut. Their population wouldn’t have been enough to make up a district in the pre-independent India. But Anglo-Indians’ abiding love for hockey rendered the correlation between population and success redundant. Second World War robbed some of the finest Anglo-Indian players of Olympic exposure and, most certainly, their gold medals. The independence wrought in changes in the composition of the national team, as Anglo-Indian hockey players started migrating to Australia, the UK and Canada. The most resplendent star of the community emerged just in time to don India’s colours at the 1948 Olympics. Football was Leslie Claudius’ first love, but it was hockey’s fortune that he shifted his allegiance to the stick game. The legendary right-half, measuring only five feet and two inches, went on to write an unforgettable chapter in Olympic hockey history by winning three gold and a silver medal, a record haul even today. Anglo-Indians faced an identity crisis when India inched towards independence. They didn’t know how they would be treated in a new nation. In those uncertain times, hockey came to their rescue as it helped them forge an identity. Anglo-Indians used the Olympics to express themselves and their excellence and success earned them a sense of belonging. When Anglo-Indians left India in great numbers for greener pastures from the late 40s, they took hockey along with them. Rex Norris, a member of the Indian squad at the 1928 Olympics, became a pioneering coach of the Netherlands national team in the 50s. He also coached Italy and Mexico. Jon Potter was a key player of Great Britain’s gold-medal winning team at the 1988 Olympics. Anglo-Indians shaped Australian hockey and it is a story for another day. Anglo-Indians and hockey are an estranged couple these days. Adam Sinclair, who played at the 2004 Olympics, remains the only prominent name at the moment, even though a place in the national squad continues to elude him. The second Anglo-Indian hockey tournament, starting at the MRK Stadium, Egmore, on Friday will be a nostalgic trip for those conversant with the community’s association with the game. Claudius will be there as chief guest. Trevor Vanderputt, author of Hockey Odyssey, will also grace the tournament. 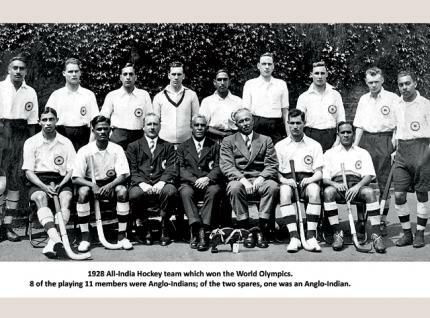 Harry MacLure, editor of Anglos in the wind and one of the key men behind the tournament, is hoping to stoke the hockey fire in Anglo-Indian children. Let the game begin. Prominent clubs: Christ Church Old Boys (Jabalpore), Agra Telegraph, Calcutta Customs, Port Commissioners (Calcutta), Bengal Nagpur Railway, Southern Railway, Telegraph RC (Chennai). Olympic achievements: Leslie Claudius (three gold and silver). Richard Allen (three gold medals). E. Penniger, C. Tapsell, L. Hammond (two gold medals). Super GK: Richard Allen conceded only three goals in three Olympics (1928, 1932 and 1936). Captain cool: Penniger was the stand-in skipper at the 1928 Olympics final in place of Jaipal Singh Munda, who couldn’t make it to the starting XI. Bronze for Britain: J.V. Conroy was the first Anglo-Indian to play for Great Britain. He played two Olympics in 1952 and 1956, winning a bronze at Helsinki. Anna and Arjuna: Ann Lumsden received the Arjuna award in 1962, the first woman hockey player to get the honour. Calcutta run: From 1905 to 1924, Anglo-Indian clubs won the highly-competitive Calcutta League 17 times. Praise from the master: Garney Nyss was unfortunate to miss out on the 1932 and 1936 Olympics. But he had the honour of being called “a player from heaven” by Dhyan Chand. Nyss was also adept at speed skating, athletics, cricket, badminton and tennis. The handsome man from Calcutta could play the guitar proficiently.